If your marketing department has unlimited resources, you can leave this landing page right now. However, if you’re like the vast majority of marketers, prioritizing your efforts using the limited resources you have is a major challenge. Specifically, when it comes to A/B and multivariate testing, there are many factors that can influence the ROI impact of how you prioritize your testing queue — after all, many of us have more good hypotheses for tests than resources to run those tests. 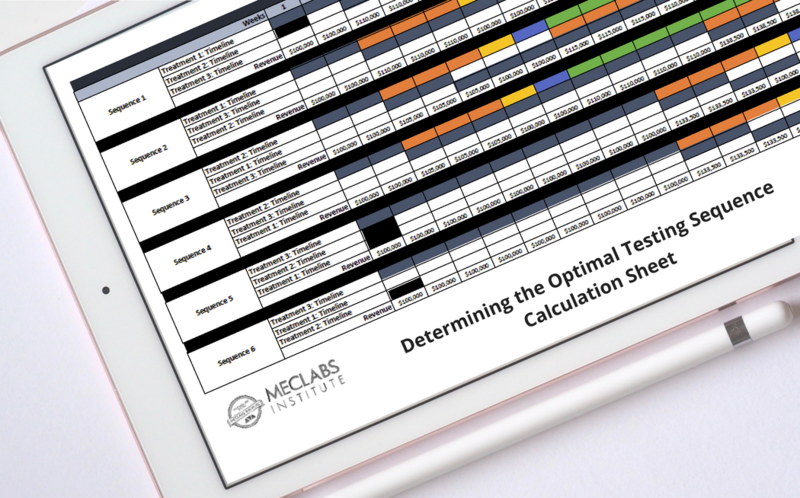 MECLABS Institute (parent research organization of MarketingSherpa) has created this simple tool to help you visualize the factors that affect the ROI from your testing efforts — from design and IT development build time to time for analysis of the test results. Because the sequence of when you run different tests can have a significant impact. You can then use this tool to share the impacts of test sequencing to get buy-in from internal business decision makers, external agencies and also from your marketing, design and development teams. When everyone can see the impact of their efforts, they are more likely to become part of the solution. To get the MECLABS Test Planning Scenario Tool right now, simply fill out the form, and we’ll send you an email with a link to download your copy. In addition, if you need a growth partner to help wring the maximum efficiency and effectiveness from your testing efforts, check the box in the form and someone from MECLABS will contact you.